What if everything you think is true and real about your life is a lie? Ava's life in the coastal South appears nearly perfect after her recent marriage to the powerful and handsome Mitchell Carson. She loves her husband and the family they have created. Even Mitchell's young son from a previous marriage, Jack, with his superhero ambitions, can't imagine life without Ava. Outwardly, Mitchell appears to be a caring husband and doting father, but as Ava soon discovers, there is a dark side to Mitchell Carson that she never imagined. When Graham Thomas, a lawyer with a secret past, stumbles into Ava's life, everything changes. Mitchell's jealous streak emerges after an innocent encounter between Graham and Ava, and Mitchell soon convinces himself that Ava is unfaithful. When Mitchell starts divorce proceedings and a custody war, Jack is caught in the middle, which soon makes him question Ava's pure intentions. As Ava searches for a way to save her family, she begins to uncover her husband's secret past and capacity for unhinged jealousy and rage. Center of Gravity ended up being so different from what I expected when I started listening to it. I expected it to be a behind-the-scenes look at a "perfect family" that isn't as perfect as we first expect, however it was so much more! The reader (or listener in my case) gets to see inside the heads of these characters which, in the case of Mitchell, is quite disturbing. The story is told through the point-of-view of numerous characters, namely Ava, Mitchell, Sam, Graham, and a court-appointed psychologist. I loved this as it gives such a rounded view of this disintegrating marriage and family and allows us to see the various characters grapple with the sometimes insane-seeming situation before them as well as view how they try to justify what is happening. In the case of Mitchell this is quite chilling as we discover, quite early on, that he's rapidly coming unhinged. I found it fascinating to see how far he would go - lying, scheming, planting false evidence, and so much more - in his quest to get what he wants and ruin Ava after he's convinced she's been unfaithful to him. Watching Ava try to rationalize what is happening around her (surely this couldn't be happening to her happy little household, could it?) as well as come to terms with the increasingly horrific facts she finds out about her husband was also so interesting. With such a host of appealing (or disturbing) characters, my favorite would definitely be Jack. His point-of-view is so endearing and it broke my heart to watch him wrestle with loving his mentally abusive father, take care of his baby brother Sam, and try to figure out how to make his family whole again. He wants so badly to be like the superheroes he loves so much, which is a lot of pressure for an 8-year-old. He's such a sweet, smart, and brave little character and I just ached watching him go through so much at the hands of his own father. The pace of the narrative was great as well. In the beginning the pacing was somewhat slow as this world slowly begins to unravel, but then it picks up and continues to build intensity, reaching near breakneck speed at the end. I found myself unable to stop listening until I could see how it would end and discover if all of our characters would make it out alive. Being an audiobook I should comment on the narrator as well. Lisa Larsen was an excellent narrator and did a fantastic job of changing up the voices of the characters, which is especially impressive given the large cast. She also did a great job of altering the tension and pacing to keep the listener invested in the story and making it hard to turn it off. 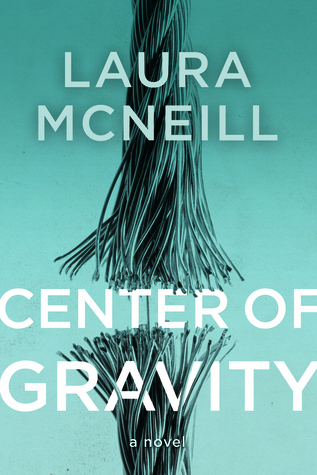 Center of Gravity is a great peek into the home of a psycho husband who convinced so many - including his wife! - that he was the perfect family man. You won't be able to look away as the plot unfolds and the illusion of perfection tumbles down. I highly recommend it for those that enjoy a suspenseful listening experience! While I didn't initially think much of it, now that I've read the story I think it fits it very well. The build up of all that Mitchell has kept hidden - and the discovery of the lengths he will go to to get what he wants - makes the narrative feel tighter and tighter until - snap! - it quickly unravels the many lies and lays bare the terrifying facts. I definitely appreciate it more after reading it! I purchased a copy of Center of Gravity from Audible for my own library. All opinions are my own. Find more about the book, including other reviews and links to where you can purchase your own copy, on Goodreads HERE.